This serum helps letting-go, nourishing your skin too! This serum helps letting go. Stress, fears, phobias & anxiety disappear. Once balanced & grounded, YOU keep going! Formulated for all types of skin. Why Transition Facial Serum is efficient? We tailor facial serums with only 2 types of organic and sourced ingredients which are carrier & essential oils. 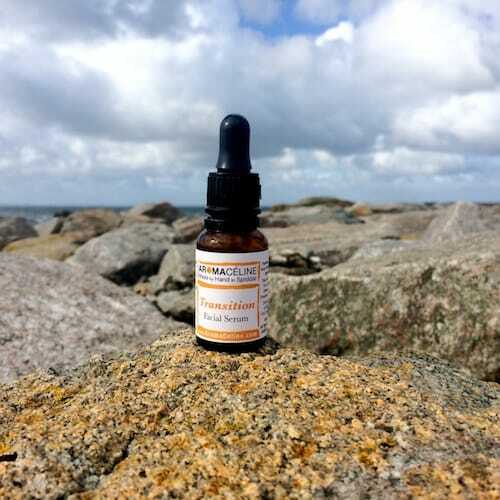 Our serums are 100% highly concentrated and extremely potent, only containing active ingredients. As they contain NO water, their ability to reach the deep layers of the skin and deliver a high level of active ingredients, is a wonderful help to battle many common beauty complaints and disorders. All carrier oils nourish, protect, lubricate, moisturize and soften your skin. Serums texture are much finer than creams and are more readily absorbed by skin. Do I use a cream on the top of my serum? Your cream will destroy your serum efficiency, especially if this cream is a conventional cosmetic moisturiser! How to Use the Transition Serum? Better efficiency when applied on a clear skin.